To prepare you for your Fall 2018 POLs, please complete the following activity by Friday. You may work on this after completing the work for your blog/vlog/podcasts. Please complete the handout first by clicking the black button to the right. After completing the handout, you MUST submit your answers via the sumission form. 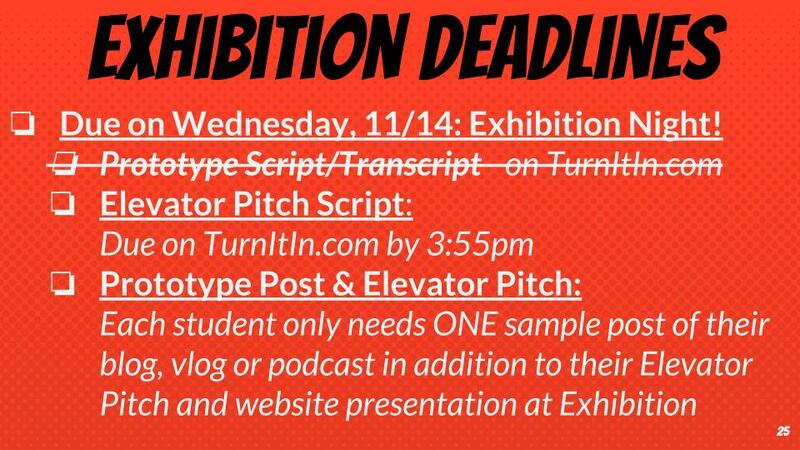 Assignment|11/26, 11/27|: Post-Exhibition Reflection Due In-Class Today! Greetings Bloggers, Vloggers & Podcasters! This week, we are moving forward with designing our own digital media content and websites on which to host them! Mon/Tues (11/05 & 11/06): Digital Content Design Overview: For our first block period of the week, we are getting to work on designing website where we will host our blogs, vlogs, and podcasts. We will talk about requirements for designing our content, and about major dues dates for these deliverables. See the buttons to the right for the Overview and for the Week 13 slideshow to catch up on in-class notes. Wed/Thurs (11/07 & 11/08): Elevator Pitches: For our second block period of the week, we will introduce a business skill called the Elevator Pitch. 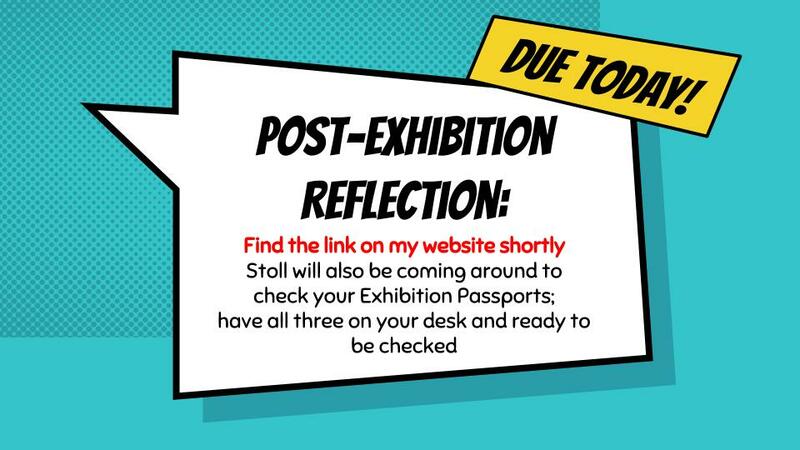 Students will start outlining their ideas for how to use this short, effective speech on Exhibition Night to discuss, with potential consumers or investors, plans and future goals for their blog, vlog, or podcast. Friday (11/09): Websites and Digital Content Outlines Due: On Friday, Stoll is checking websites for all necessary components and for strength in branding consistency. 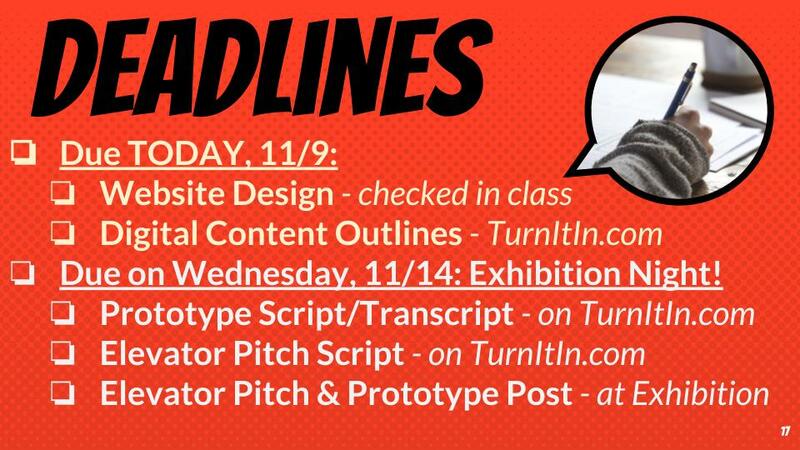 Students will have work time to work on content outlines, designing content, and writing Elevator Pitches. Mon/Tues (10/15 & 10/16): Macbeth Act I, scene v-iiv: For our first block period of the week, we are starting with some Golden lines practice for review the first part of Macbeth, Act I. From there, we finish the rest of Act I (meeting the delightfully devious Lady Macbeth) and practice Golden Lines that we have found on our own. See the button to the right for the Week 10 slideshow to catch up on any notes missed. Wed/Thurs (10/17 & 10/18): Macbeth, Act II: For our second block period of the week, we are continuing on with the next Act of Macbeth. Students receive feedback on their Act I Golden Lines, and have time to work on lines from Act II. Friday (10/19): Digital Media Exploration: Podcasts: On Friday, we are beginning the research portion of our Exhibition deliverable for English 12! See the button to the right for more information about Phase 2 of the "Innovating Success Project".